Car seat safety experts have warned parents about the need for proper restraints after discovering a ‘shocking’ substitute. Staff from Child Seat Safety Ltd were carrying out spot checks on car seats when they came across a parent using part of a buggy instead of a car seat. It was being used for a nine-month-old baby to sit in while in the front of the car. 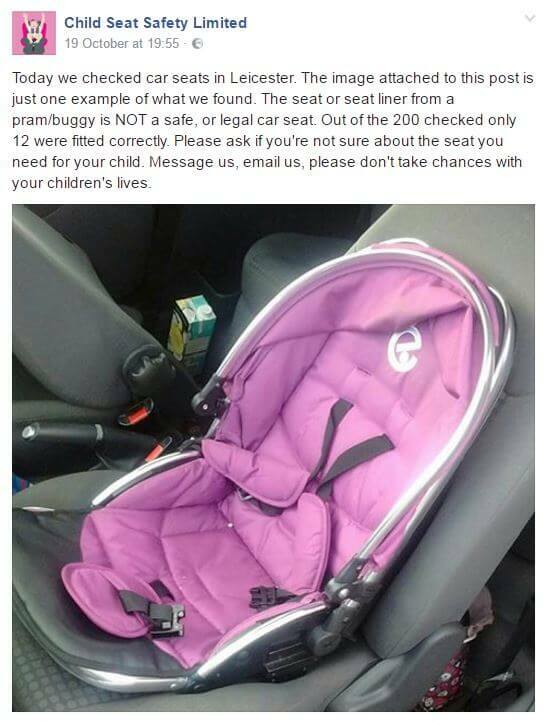 The group shared the image on its Facebook page and said it was one of 200 car seats checked in Leicester last Wednesday – of which only 12 were fitted correctly. After being inundated with comments from concerned parents, many of whom said they were ‘shocked’ that parents would use such a poor substitute, the company said it took full steps to ensure the child would no longer be travelling in it. “Please be assured they are not allowed to leave the site with the child in the vehicle until an appropriate restraint is provided and checked by ourselves and only when we are completely satisfied it’s suitable are they allowed to continue their journey,” the company wrote in response to one comment. For more information visit the Child Seat Safety Ltd Facebook page, or visit www.childseatsafety.co.uk.